Grown for the flowers which are also widely used as cut flowers, Calla Lilies are very popular both as garden plants and in the florist industry. 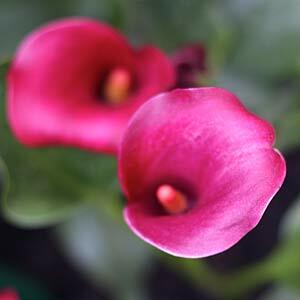 Grown for the highly ornamental flowers, Calla Lilies are dormant over the winter months and will put on lush green foliage in spring that holds well right through summer. The main flowering period is from spring to summer. What is offered by wholesalers today is a variety of hybrids that produce flowers in a range of colours from the traditional white to yellows, pinks, reds and a number of shades in between. Dwarf or compact growing types are also available, well suited to growing in containers as well as in the garden border. Grow in the border as a background plant, smaller types can be grown in containers. Available in both dwarf growing and regular heights. Flower colour varies from white to yellow, pinks and reds.